A peaceful respite from the busy streets of Barcelona. Photo courtesy of Casa Bonay. Budget-friendly doesn’t always mean drab and dreary. There is such a thing as the boutique budget hotel, and some of the best cases exist in Barcelona, Spain. Bespoke modern furniture, partnerships with hip local purveyors, and a curated wellness space are a few of the perks you can find — if you know where to look. Luckily for you, we have a handle on such things. Here are four of our favorite boutique hotels in Barcelona, all of which have rooms available for €250 or less. Atmosphere: Named for the elusive-but-glamorous daughter in Wes Anderson’s The Royal Tenenbaums, the mostly white, elegant, understated nine-room hotel is minimal in style with all the comforts of home, including a beautiful breakfast spread in the kitchen, a cute concept shop with items seen around the hotel, and free WiFi. Perks: Get to know the city with a . 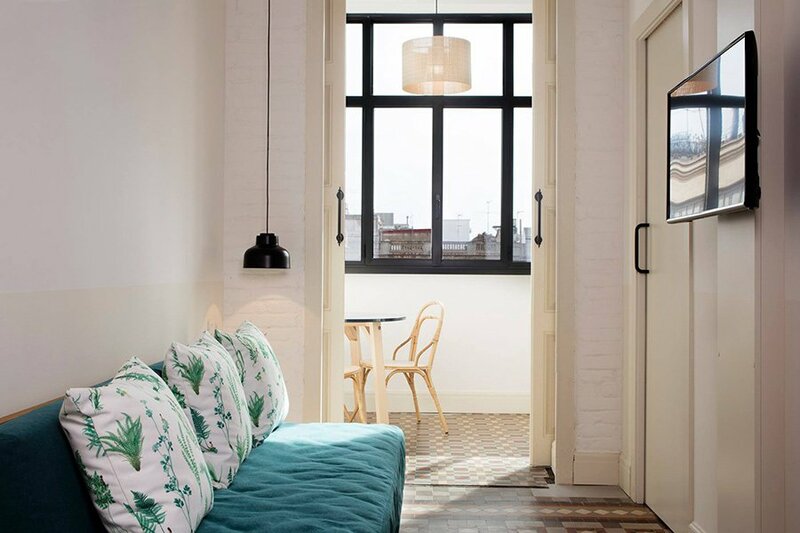 Atmosphere: Set in a 19th-century Neoclassical building in the peaceful Dreta de l'Eixample neighborhood, the 67-room hotel was decorated by Brooklyn-based design company . A simple palette of whites, blues, and greens is complemented by the interior’s original mosaic floors, lighting by , and furniture by . Perks: A collection of local purveyors like Catalan baristas and indie publishers were tapped to add a special touch to the common spaces. Atmosphere: Bespoke modern furniture is mixed with Sri Lankan and European antiques and an abundance of green plants to create a look that can only be described as “tropical modernism.” The 20-room hotel has a dreamy rooftop pool ideal for afternoon dips, a small shop selling local goods, and a cafe serving artisanal coffee and other delectables, like fresh-pressed juice and Spanish buñuelos de bacalao and jamón. Perks: is a industrial-style wellness space where guests can enjoy free yoga classes and training sessions. Atmosphere: Just a short walk from the lively and charming Gothic Quarter, the boutique hotel's 56 guest rooms are admittedly compact, but streamlined modern furniture and a yellow and gray color scheme more than make up for it. Also on site: a tapas restaurant, free WiFi, Finna bicycles, and laundry facilities. Perks: The rooftop terrace has stunning 360° panoramic views of the city and a small plunge pool.